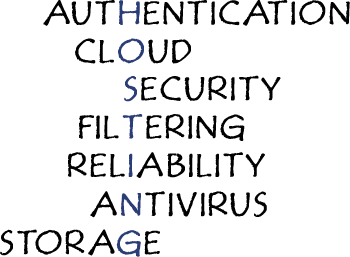 Email hosting is the service of managing and maintaining email traffic to a domain on host servers. Simply put, it allows you to send and receive email without needing a server or all of the responsibilities that go with it. Our Email hosting services offer you premium email as opposed to free email or webmail that is advertisement supported. Businesses generally need email hosting services because they want an email address associated with their domain name, like yourname@yourbusinessname.com. Our Email hosting allows for premium email services that may include custom configurations and a bigger number of accounts. We use our time and expertise to maintain email and servers, so our clients don't need to. We have one of the highest email limits of any of our competitors. We allow incoming and outgoing emails as large 20MB each and each user gets over 100MB of server storage. Our email data is backed up regularly, and virus scans all incoming and outgoing email before processing. The email program is hosted on multiple servers for redundancy and load balanced to maintain highly efficient and fast processing of email. Our email servers are licensed and regularly maintained. In addition, our virus software is updated daily to help eliminate the spread of newly developed or distributed viruses. Our clients even have the ability to manage accounts, permissions and features for users, and distribution groups on their own if they wish, otherwise we are always available to assist and make changes for you as needed. Computer Development Systems, LLC is the force that enables you to effectively represent your business concept to your most valuable asset: your clients. CDS helps you get the right message across in the right way at the right price.